Grand Theft Auto V will go on sale on September 17, and game publishers Rockstar Games have released the official trailer of the game. The game will be released for both the PlayStation 3 and Xbox 360 consoles. The action in the game takes place in two fictional locations, Los Santos and San Andreas, in a re-imagined Southern California. 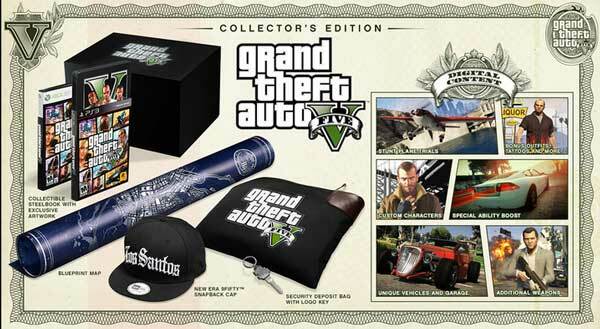 It can be played in single-player mode, or by up to 16 players in Grand Theft Online mode. The standard edition of Grand Theft Auto V for PlayStation 3 and Xbox 360 has an RRP of $109.99, though you’ll be able to pick it up considerably cheaper than that online. There will also be special edition versions of the game sold, with the following additional features, bonus content, and merch. Collectible SteelBook with exclusive artwork – features double-sided, never-before-seen artwork of Michael, Trevor and Franklin. Blueprint map – exclusive, additional 21.5” x 26.75” map displays a blueprint view of Los Santos and Blaine County. Cryptic markings indicate locations for fast cash and other points of interest for the up-and-coming entrepreneur. Grand Theft Auto V security deposit bag with logo key – custom 10.75” x 8.5” money bag features a pop-up style lock and laser cut logo key to secure important items. The reverse side features a pressed Rockstar Games logo on the security mount with a framed ID window. Grand Theft Auto V New Era 9FIFTY snapback cap – features an embroidered Los Santos logo on the front, a stitched, black Rockstar Games logo on the wearer’s left side, a Grand Theft Auto ‘V’ logo applique on the opposite side, and snapback closure for an adjustable fit. Custom characters for Grand Theft Auto Online – classic Grand Theft Auto characters to use within the Grand Theft Auto Online Character Creation System. Unique vehicles and garage property – players will instantly receive a garage to store custom vehicles. In single player, the garage will be stocked with the 1930s style Hotknife hotrod and the CarbonRS sports bike. In Grand Theft Auto Online, players will get the high-end Khamelion electric car. Grand Theft Auto V Special Edition will have an RRP of $119.95, while the Grand Theft Auto V Collector’s Edition’s RRP will be $169.95. For a longer look at the game, and the gamescape in which the action takes place, Rockstar Games earlier released this gameplay video. It introduces you to the three lead characters of the game, along with a peek at some of the game’s missions, and what you can do in terms of going off-mission in the game, just poking about in the geography and personalities within the game. Like this article? We’d love you to use the Facebook Share button below.